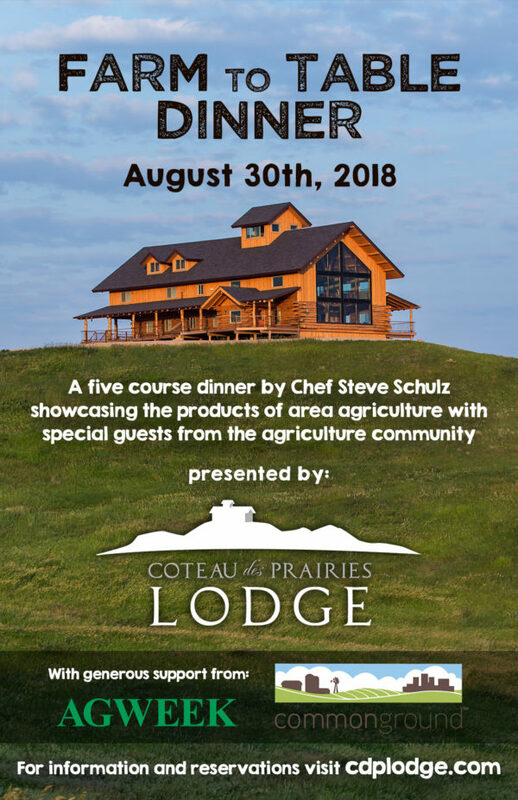 Coteau des Prairies Lodge presents Farm to Table Dinner on August 30th, 2018. Our Farm to Table Dinner is a five course dinner showcasing the products of area agriculture with local beer pairings and special guests from the agriculture community. The talented Steve Schulz, Executive Chef from The Toasted Frog (Fargo), has crafted an incredible menu sourcing foods almost exclusively from area producers. In addition, local agriculture experts will be sharing their experiences from the field and explaining the importance of conservation. Dr. Abbey Wick, North Dakota State University Extension Soil Health Specialist, has experience working with farmers on soil health building practices like incorporating cover crops into rotation and transitioning to no-till systems. She has been featured in Successful Farming Magazine and other publications for her work in the agriculture community. She was Senator John Hoeven’s selection to represent North Dakota for the Senate Ag Republicans “Women in Agriculture” campaign in 2018. 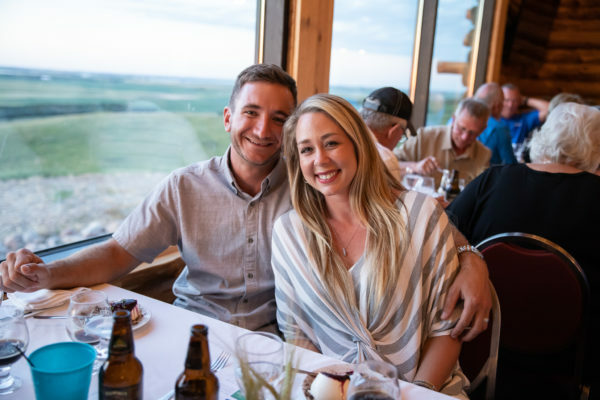 She is also a familiar face at Coteau des Prairies Lodge where she has organized numerous educational events for farmers. Steve Rosenzweig, PhD is a soil scientist at General Mills, where he leads research and outreach projects across North America to support farmers in improving soil health. Steve grew up in upstate New York where he took an interest in ecology and the environment. As an undergraduate biology major at SUNY Geneseo, he wanted to study an exotic ecosystem like tropical rainforests or coral reefs, but instead spent a summer in Kansas researching how soils change as they are restored from a wheat farm back to the native tallgrass prairie. This experience gave him an appreciation for soil as a complex ecosystem, and showed him that farmers can tap into this powerful resource beneath their feet by managing for healthier soil. Currently living in South Dakota, but spending most of his time traveling for work, Steve’s hobbies include things you can do while waiting in airports or driving a car, like humming to himself. Jesse Frolek is a 4th generation farmer from near Lidgerwood, ND. He along with his father and brother run a corn and soybean crop rotation on 2,200 acres and have been no-till farming for more than 30 years. As a means to diversify and offset low commodity prices, Jesse recently turned his long-time gardening hobby into a business. ‘Uncle Jesse’s Produce’ provides fresh, seasonal produce to local farmer’s markets and CSAs. Check back for a full list of area farms & producers featured in Chef Steve’s menu. The event is on Thursday, August 30th Coteau des Prairies Lodge. Everyone is welcome, but space is limited and meals are available by reservation only. Alcohol will be served only to those over 21 years of age. The price is $70 per person. Beer pairings are included in the price of the meal. Water and coffee will be provided. Sodas and additional alcoholic beverages will be sold at the bar. Doors open at 5pm, guests are welcome to come early, tour the lodge and enjoy refreshments served at the bar. When you arrive at the lodge, sign your party in with our hostess. Guests will be seated for the meal promptly at 6pm.